KOCHI- India will launch its first indigenous aircraft carrier INS Vikrant on Monday, making an entry into a select club of countries capable of designing and building a carrier of this size and capability. Defence minister A K Antony’s wife Elizabeth will launch the 37,500 tonne carrier at Cochin Shipyard, close to four-and-a-half years after its keel was laid by the minister. INS Vikrant with a capacity to carry 36 fighter planes would go for extensive trials in 2016 before being inducted into the Navy by 2018 end. Only US, Russia, UK and France have successfully designed and built aircraft carriers. Nearly 90% of INS Vikrant’s hull has been built indigenously with DRDO and SAIL supplying high quality steel. The Indian Navy and Cochin Shipyard Limited (CSL) will soon sign the agreement for the second phase construction of the indigenous aircraft carrier (IAC), which will be floated out on Monday. Top Navy and CSL officials have finalized the cost of the second phase. However , they refused to divulge the details at this stage. “The cost negotiation committee of the Navy has worked out the cost in consultation with the CSL, and it has been sent to the defence ministry. 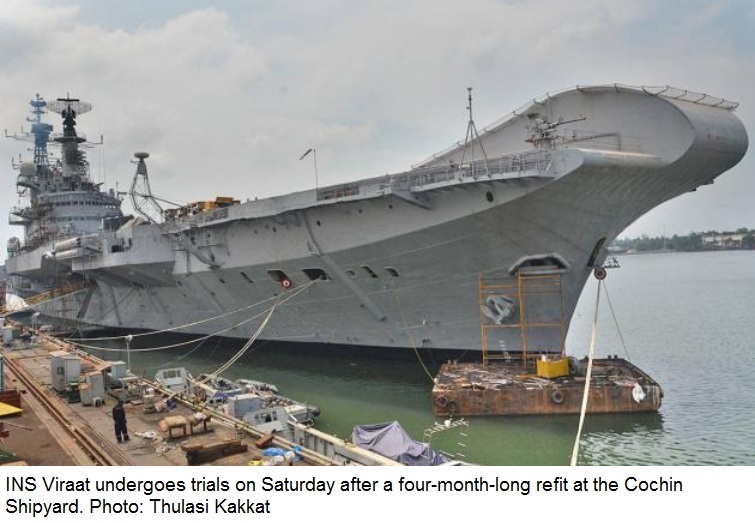 It will have to be approved by the Cabinet Committee on Security,” a top naval official said on board the vessel. The phase 1 contract, which included building of the hull structure and fitting of the propulsion system, was awarded by the Navy to the CSL at a cost of Rs 1,160 crore. The next phase involves the work on the entire hull structure, laying all the pipelines , cabling, ventilation trunkings, fitting all the motors and switchboards, and other facilities like dwelling units for the crew. The float-out of the IAC, to be eventually named INS Vikrant, is yet another reason for the Navy to rejoice as it coincides with the nuclear reactor of INS Arihant, the country’s first ballistic missile submarine, achieving criticality on Friday morning . Both these will enhance the Navy’s capabilities manifold , naval officials said. The flight deck of IAC will have the capacity to hold 19 aircraft and the hangar inside will have room for 17 fighters. The time interval between the take-offs of two fighters from the ship can be as low as three minutes and can be reduced to less than two minutes, naval officials said. Naval and CSL officials said that the float out has given them the confidence to bid for the country’s second IAC too. However, controller of warship purchase and acquisition Vice Admiral K R Nair said the Navy was yet to finalize the plans for the second IAC. Naval officials said it would be difficult to decide when India’s solitary aircraft carrier INS Viraat would be decommissioned. It would be possible to operate it as long as the hull structure is intact, they said. India will get the refurbished 44,570-tonne Admiral Gorshkov, undergoing a refit at the Sevmash Shipyard in North Russia, later this year. CSL chairman and MD Commodore K Subramaniam said the shipyard is trying its best to keep the deadline of 2018 set for the final launch of the IAC. “Most of the countries take nine to 12 years from keel laying to final delivery . The IAC’s keel was laid in 2009 and if we deliver it by 2018, we will be on par with other countries in the field,” he said.